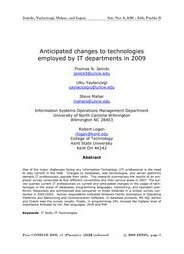 One of the major challenges facing any Information Technology (IT) professional is the need to stay current in the field. Changes to databases, web technologies, and server platforms demand IT professionals upgrade their skills. This research summarizes the results of an employer survey conducted at four different universities and their service areas in 2007. The survey queried current IT professionals on current and anticipated changes in the usage of technologies in the areas of databases, programming languages, networking, and operation platforms. Responses are summarized and compared to those obtained in a similar survey conducted in 2002/2003. Survey respondents indicated Windows Family dominance in Operating Platforms and Networking and Communication Software. In database products, MS SQL Server and Oracle lead the survey results. Finally, in programming XML showed the highest level of importance followed by the .Net languages, JAVA and PHP.